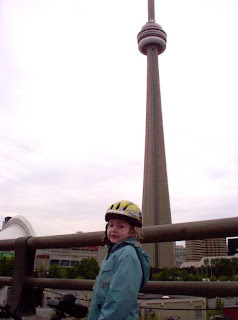 This morning my 5-year-old daughter and I took part in the Ride for Heart. It takes place annually in Toronto as a fundraiser for the Heart & Stroke Foundation. Two major highways are closed to traffic and 13,000 cyclists take over, winding through downtown Toronto then up the Don Valley. Very neat event. I've been riding it ever since I moved here in 1998, I think I've only missed one in 10 years. The rain held off and we had a great day. She loved seeing the CN tower and Rogers Center from the top of the Gardiner, and really loved the cheering crowd at the finish line! And daddy got in a pretty decent workout, I pushed as hard as I would on a 1 hour training ride. The extra weight of the hybrid and the trailer with the 5 year old was good power mileage! And I don't care who you are - picking off dudes on Cervelos when you're pulling a kid behind you is good for the ego (even if they are probably doing the longer distance!). I hope my daughter picks up a love of cycling, but even if she doesn't at least I'm giving her every opportunity to see what it's about. That's awesome getting the kids involved in this stuff. I know that for me, if it weren't for sport, I'd have turned out a lot different (and would have been in a lot more trouble).